Note from Magnolia staff: what follows may appear to be a daunting read, but it's absolutely worth it. 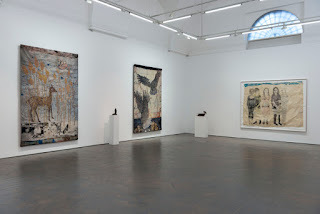 Brilliant Milan-based art writer Gabriele Guercio reveals how tapestries got lost in the 18th century beaux-arts system, and makes a strong case for the radical possibilities of genre-defying creativity. On a day when many in Oakland are feeling radicalized, it's good to remember that artists have been "esteeming human creativity over and above the material basis of its...outlets" for centuries, regardless of what the so-called authorities have to say about it. The sharp divide between art and craft has deeply affected tapestry's reputation in the West. Renaissance artists and writers initiated this rift, privileging works in painting and sculpture as the offspring of a liberal practice intermediating between the perceptions of the outside world and the visions of the artist's imagination. The divide was fully achieved, however, only in the eighteenth century with the foundation of the beaux-arts system. This discrimination between art and craft, artist and artisan, helped to establish the autonomy of works of art. It placed them within a realm of illusion, deliberately aloof from the dynamics of the world and reality at large, by differentiating artistic experience from other experiences and by circumscribing the potentially unlimited manifestations of human creativity to a quantified number of artistic activities. These radical distinctions made tapestry's "artistic" status uncertain. As the beaux-arts gained prestige, the taste for and market value of tapestry waned. No longer a precious collectible, tapestry was valued no more than other household items. Its appeal, when felt, was due to its decorative appearance and versatility. Subsequent calls for a re-evaluation of tapestry, when they came, often attempted to align it with other supposedly major arts, primarily painting, and thus implicitly ratified the very principles of the modern system that had devalued tapestry in the first place, without esteeming human creativity over and above the material basis of its heterogeneous outlets. [An] artist's contributions cannot be merely knowledgeable additions to the internal histories of particular arts, nor to the introduction of new mediums. In a world of people on the move, an artist must always stand ready to correlate signs and events, unrestricted introspectiveness and situated energies. These correlations depend not so much on expertise rooted in specialized traditions as on deepening the generic expertise of creativity. Generic creativity is a resource that an artist can rely upon and expand whenever a radical restaging of received procedures and means of expression is felt necessary for cultural, ethical, and political reasons. - Gabriele Guercio in William Kentridge: Tapestries. Basualdo, Carlos (ed). Yale University Press, CT, 2008.